And a second post-Brexit article, this time for the Guardian, covering some of the same points but this time focused singularly on the far right and the implications for them for the Brexit vote. This has some depressing portents in the future for it, and lets hope that politicians and others can find ways to move us forwards. The result of Britain’s referendum on EU membership has strengthened far-right activism across Europe. In the UK there have been reports of public racist abuse, while far-right-leaning parties across the continent have taken advantage of the situation to call for their own referendums. There is a danger that an already polarised political environment will become even more broken with some individuals choosing a path to violence in response. Extreme rightwing terrorism has been a growing problem in Europe for some time. A recent study by a consortium led by the Royal United Services Institute (RUSI) highlighted that when looking at the phenomenon of “lone actor” terrorism in particular (terrorist acts conducted by individuals without any clear direction from an outside group), the extreme right wing was responsible for as many as Islamist extremists. And not all were random one-off killers – Anders Breivik was able to butcher 77 people in a murderous rampage in Norway. What was particularly worrying was the fact that these individuals sat at the far end of a spectrum of extremists that included elements closer to the mainstream. In the runup to conducting his act of terrorism, Breivik claimed to have attended protests organised by the English Defence League (EDL), a group he admired for its stand against what he perceived as invading Muslim hordes in Europe. Founded in the UK in response to a perceived refusal by authorities to clamp down on the noisy extremist group al-Muhajiroun, the EDL became a grab bag of far-right, anti-Muslim, anti-immigrant protesters who would take to the streets. It spawned imitators in continental Europe. The emergence of the EDL, however, came at a moment when more established European nationalist groups such as Front National in France, the British National party (BNP) or the Austrian Freedom party, all became prominent in the public conversation. Far-right nationalist xenophobic sentiment has always been a part of the European conversation, but the strengthening of these groups highlighted how much the ideas they represented had started to slip into the political mainstream, largely off the back of anger with the usual parties of power. 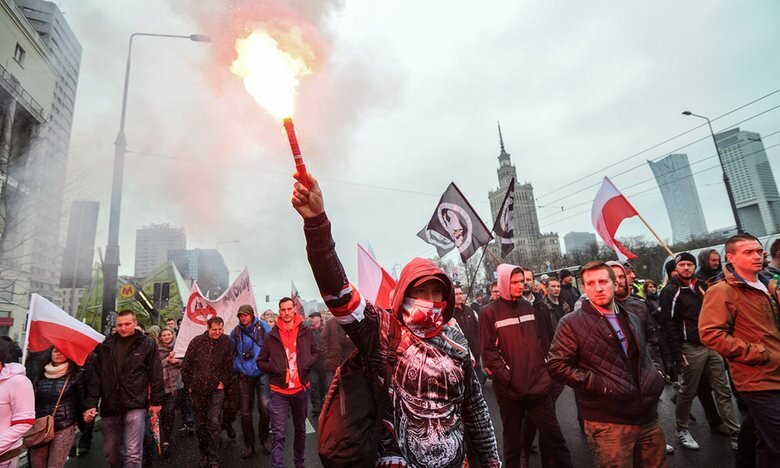 But while the far right tried to move itself into the mainstream, its violent edge remained, and as the European debate on immigration and Muslims has become more pronounced, there has been a growth in incidents of extreme rightwing violence. The response from security forces has been mixed. While we have seen an apparent increase in extreme rightwing violence, there has been less attention paid to it by authorities. In the RUSI-led research, a particularly striking finding was that in about 40% of cases of far-right extremists, they were uncovered by chance – the individual managed to blow himself up or was discovered while authorities conducted another investigation. By contrast, around 80% of violent Islamist lone actors were discovered in intelligence-led operations – in other words, the authorities were looking for them. But it is easy to understand why the extreme right wing gets overlooked. Most examples are fairly shambolic lonesome individuals whose efforts to launch terrorist plots seem amateurish at best. But they are still attempting to kill fellow citizens to advance a political ideology. And in the case of lone actors, they are at least as lethal as their violent Islamist counterparts – in our dataset of 120 cases, even when one removed Breivik as an outlier, the extreme right wing was as lethal as violent Islamists. The concern from this phenomenon must now be twofold. On the one hand, the increasing mainstreaming of a xenophobic anti-immigrant narrative will feed the very “clash of civilisations” narrative that groups such as al-Qaida and Isis seek to foster – suggesting that there is a conflict between Islam and the west which they are at the heart of. It will only strengthen this sense and draw people towards them. But there is also the danger of frustrated expectations. The reality is that notwithstanding a rise in anti-immigrant feeling in Europe, the migrants will still come. Attracted by the opportunity and prosperity they see in Europe (which is often a huge improvement on the environment they came from), they will come to seek low-paying jobs – jobs that western economies will still need to fill and are not taken by locals, which offer better prospects than where they came from. This economic dynamic means that people will not necessarily notice a dramatic change in their material environment. Foreigners will continue to come and will continue to be a presence around them – providing a community to blame when individual economic situations do not change or feel like they are getting worse. Here lies one of the more dangerous sides of this new European political environment. A polarised society which does not appear to materially change – frustrating those who feel like they have expressed their political will only to find it unanswered. The result, unless handled properly by the mainstream political community, is a potential for violence that has already reared its head brutally on the European continent, and unless carefully checked will do so again. Could Paris happen in the UK? Final piece from last week, this time looking at whether the incident in Paris could take place in the United Kingdom for my home institution RUSI. While it is likely not the last on this topic, likely the last commentary at this point. In addition to commentary, spoke to Financial Times, Wall Street Journal, New York Times, Daily Mail, NBC, The Times, Bloomberg, while the Mirror ran an interview with a press agency as an interview. In the immediate wake of the incident, RUSI also recorded this brief interview for our site. Prior to the terrible events of last Friday, spoke to Wall Street Journal, Politico and La Repubblica about the large network of arrests linked to Ansar al Islam and Mullah Krekar, and more recently to Bloomberg and Voice of America about the impact of recent deaths on China’s contributions to the current war on terrorism. Soon after the Paris attacks, the prospect of similar massacres happening in the UK was raised. While the danger is serious, crucial contexts specific to the Continent mean the UK faces a different kind of threat. In the wake of the horrific terrorist attack in Paris, the immediate question posed in the UK was whether this could happen here.The prime minister made a clear statement about the potential risks, stating that British security services had disrupted seven attacks in the past six months, ‘albeit on a smaller scale to what was seen in Paris’. The potential threat is certainly present, but, at the same time, certain specific local contexts create slightly higher hurdles for a terrorist group to launch such a terrorist attack in the UK. There are three principal reasons for this. First, it is harder to obtain high-powered rifles in the UK. Looking at the massacre in Paris, it is clear that the greatest number of casualties were caused by the use of assault rifles, which the cell was able to acquire in worrying numbers. Such rifles appear to be more easily available on the continent. Whilst the investigation has yet to publicly uncover the source of the weapons, their availability is clearly a persistent problem in France and neighbouring countries. Since the beginning of the year, three different cells have attempted and succeeded in launching attacks with such weapons in France alone. In January, a cell in Verviers, Belgium, was found to be in possession of a number of high-powered weapons and explosives. When police tried to arrest the group, the fighters did not hesitate to fight back; they were killed during the shootout with police. Beyond terrorists, criminal networks in places like Marseille quite regularly get involved in public shoot-outs using such weapons. So far, in the UK, terrorist cells have not been able to access modern or high-powered weaponry. Fusilier Lee Rigby’s murderers Michael Adebowale and Michael Adebolajo were able to get an antique pistol for their plot in 2013, but the weapon failed to work and blew up in Adebowale’s hands. A cell disrupted earlier this year and going on trial soon were only able to get their hands on a Soviet-era weapon to advance their plot. Networks have certainly sought to obtain higher-powered weapons, but restrictive laws and availability mean it is harder to do so in the UK than in Continental Europe. There are some worrying indicators regarding the proximity between terrorist and criminal networks, but so far this has not placed the same kind of equipment in the hands of terrorists. Second, unlike France, the UK has a greater degree of control over its borders. Natural geography means that there are fewer access points into the UK, making it relatively easier for authorities to watch entry and exit points (though the system is by no means perfect – news emerged this week that two well-known repeat terrorism offenders were caught trying to cross Hungary even though they were on no-travel lists). On the continent, the situation is very different. French authorities may attempt to get firm control over their own territory, but they border a number of countries with substantial domestic problems and with different levels of government effectiveness and cover. Yet they have open borders between them, complicating France’s ability to completely control their situation and meaning they share open borders with countries with varying levels of weapons availability as well as different criminal-justice systems. Finally, the conflict in the Levant is one with a greater draw and connection to Arab communities on the continent. This is a reality that has come at a moment when the centre of gravity of international jihadism has shifted from South Asia to the Levant. The UK has seen over 700 people go and join the fighting in Syria and Iraq – but these numbers are higher in countries like France (where officials refer to around 700 or more) and Belgium (where most recently officials refer to up to 800 having gone), which have seen large numbers of extremists go and fight, while others have instead stayed at home and stewed in anger, with some of those who were prevented from going to fight instead choosing to launch attacks at home. None of this is to say that the UK is not facing a dangerous menace. It has been featured regularly in ISIS propaganda as a target, is fighting in the coalition against ISIS and has launched drone strikes against key individuals in the group. Authorities in the UK are working at full pelt to disrupt networks, and, as highlighted before by the prime minister, some seven plots have already been disrupted in the past year. But the nature of the threat appears different. Networked plots exist, but have so far been effectively penetrated and disrupted before moving into action – though this track record is something that has been shown to be imperfect in the past. Greater levels of concern are often expressed around more dispersed plots that seem to demonstrate less clear command and control from abroad, but seek to undertake attacks like the murder of Lee Rigby. Whilst we now face the horror of a large-scale terrorist attack in Paris, the reality is that the murder of a single man in the UK almost three years ago in Woolwich had a quite substantial media impact, even if not on the scale of the atrocity in Paris. And my second post for the day, this time for an Observer article I wrote for the weekend’s paper in the wake of the near-miss terrorist incident in France on Friday. The piece oddly only appears in the iPad edition and the hardcopy, but here is the text below and a screenshot from the iPad. Worth pointing out the title was the papers choice. I also spoke to the Financial Times about the repercussions of the attack and had a longer interview with AFP which has been picked up in a number of different ways. 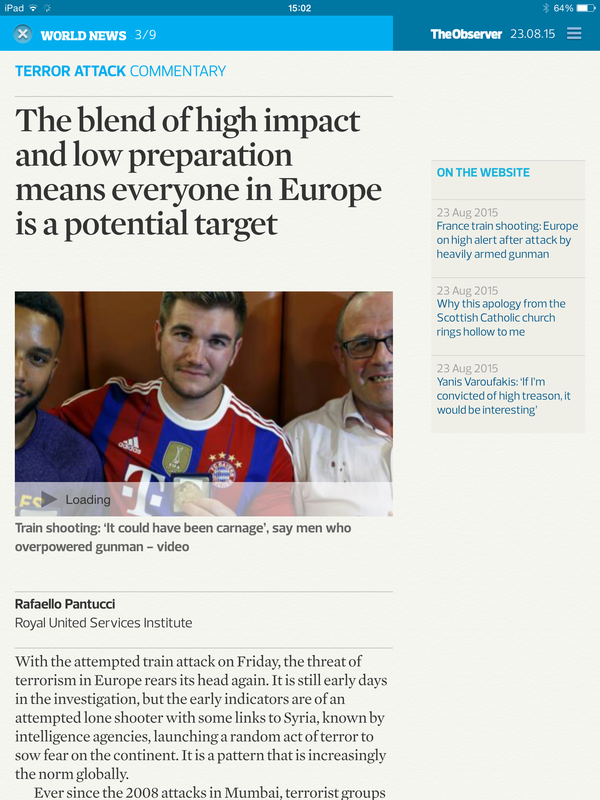 With the attempted train attack on Friday, the threat of terrorism in Europe rears its head again. It is still early days in the investigation, but the early indicators are of an attempted lone shooter with some links to Syria, known by intelligence agencies launching a random act of terror to sow fear into the continent. It is a pattern of facts that is increasingly the norm globally. Ever since 2008 terrorist attacks in Mumbai, terrorist groups have sought to launch mass casualty shootings on soft targets. The blend of high impact and low preparation required makes it an appealing way of getting your message across. The potential targets are limitless, and the only requirement is to obtain a gun – something that is easier in continental Europe than in the UK. In addition, Islamic State’s leadership has been shouting to anyone who would listen or read their material that it considers anything a target. The result has been a spate of similar attacks in Europe and abroad. The attack in Sousse saw a marauding gunmen massacre holidaymakers as they enjoyed Tunisia’s heritage and beaches. In Brussels, visitors to a Jewish museum were gunned down by a terrorist linked to ISIS as they enjoyed an afternoon tour. In Copenhagen, a lone shooter opened fire at a public event featuring cartoonist Lars Viks, killing a bystander, before heading to a nearby synagogue where he murdered guards that had been put there to protect the institution from people like him. In Canada a gunman shot a soldier as he stood on parade in Ottawa. And in January this year, two brothers murdered their way through the editorial staff of the magazine Charlie Hebdo and shot a policeman in the street as an acquaintance held a group of shoppers hostage in a Jewish supermarket. And then there are the numerous other plots that did not involve guns, or those that were prevented from coming to fruition by alert authorities. With strict gun controls, the UK has been fortunate in not having faced many such incidents. But authorities have considered and trained for the possibility, and armed response units are increasingly visible on our streets. On the continent, individual member states have varied legislation around weapons, and the free movement of citizens between countries requiring ever-tighter cooperation between agencies whose default mode is secretive. Visit Brussels today and armed soldiers stand prominently on display in their camouflage outside most public buildings. In many ways these displays are a signal of terrorist victory, a sign that we have had to militarize our response to a criminal justice problem at home. But the sad truth is that they reflect the reality of the current threat picture where a growing number of Europeans and young men globally have first hand experience of guns and a battlefield, while terrorist groups are exhorting them constantly to launch such attacks. After a period of silence, a couple of new pieces, the first for the CTC Sentinel, West Point’s excellent counter-terrorism journal. This one looks at the pernicious influence of al Muhajiroun, Anjem Choudhary and Omar Bakri Mohammed’s group across Europe. It is a subject a lot more could be written about, and the volume of information is simply massive, but at the same time there is only limited space here. The topic will become more relevant again when Anjem and Mizanur’s trial comes about, and maybe around then something else could be done on the topic. Beyond this, had a few media conversations in the past weeks. Will save the ones around the incident at the weekend on the Thalys train for the next post, but I spoke to the South China Morning Post about the bombing in Bangkok and some Chinese terror arrests, the Telegraph about the death of the last of the Portsmouth cluster of British jihadi’s in Syria/Iraq, the Daily Mail about the plan to use soldiers in cases of emergency on UK streets, the Times about the death of Muhsin al Fadhli in Syria, and the New York Times for a large piece they did about ISIS recruitment in the UK. On August 5, 2015 Anjem Choudary and Mizanur Rahman appeared in court to be charged and detained without bail. Initially arrested September 24, 2014, the men had been free on bail as investigators dug into their histories. When the decision to formally arrest and charge was made, the Crown Prosecution Service charged the men with inviting ”support for a proscribed terrorist organization, namely ISIL, also known as ISIS or the Islamic State, contrary to section 12 Terrorism Act 2000.” The specific charges seemed to crystallize a reality that was increasingly observable across Europe that the various groups associated with the al-Muhajiroun (ALM) constellation of organizations were at the heart of current European recruitment networks sending radicals to fight in Syria and Iraq. A long-standing feature of Europe’s extremist landscape, the al-Muhajiroun family of organizations is one that has been linked to a variety of terrorist organizations. One survey of plots linked to the group in the UK concluded that of 51 incidents and plots emanating from the UK from the late 1990s until 2013, 23 were linked to the group. Britain’s first known suicide bomber in Syria, Abdul Waheed Majid, had been a feature at group events since the 1990s. A similar French organization Forsane Alizza was disbanded after Mohammed Merah’s murderous rampage in 2012, while one of their associates Oumar Diaby ended up heading a French brigade in Syria. The group’s tentacles and links reach across the continent and are increasingly showing up at the sharper end of the terrorist threat that Europe is facing. Al-Muhajiroun (the emigrants) was born in Europe in February 1996 when Omar Bakri Mohammed Fostok (hereon Omar Bakri) was ejected from the organization Hizb ut Tahrir (HuT) in the UK. A long-term HuT activist, Omar Bakri arrived in the United Kingdom in 1984 having fled Saudi Arabia where his activities as an Islamist activist clashed with the state. In the UK he sought political asylum and soon rose to public prominence through his willingness to make provocative statements at any opportunity to any available media outlet. The birth of ALM in 1996 was likely the product of this style of leadership and media management clashing with the traditionally low-key and secretive HuT. The founding of ALM unleashed Omar Bakri, with the group ramping up its provocative actions and organizing an International Islamic Conference on September 8, 1996 to which Osama bin Laden, Abdullah Azzam, and many other jihadi leaders were purportedly invited. The event was cancelled at the last minute, though the publicity it generated in terms of media coverage and a documentary about Omar Bakri entitled “Tottenham Ayatollah” likely served the organization’s initial intent to attract attention. Present in the background of the documentary is Anjem Choudary, at the time a lawyer who was working as Omar Bakri’s assistant. Over time, his role evolved and in the wake of the London bombings of 2005, when Omar Bakri chose to flee the country, Choudary took over as UK leader for the group. A few months prior to Omar Bakri’s departure, the group announced its dissolution in an attempt to get ahead of security services, with a series of sub-groups emerging largely reflecting the same ideology as ALM with Choudary effectively at the helm. In the wake of the attacks, British authorities focused on the group, adding the sub-groups to the proscribed terror list at various points and seeking greater powers to restrict their ability to operate. The group, however, has continued to operate with the leadership remaining fairly constant. This became most prominently visible in around 2009 when the group adopted the name Islam4Uk, which was proscribed a year or so later. This style of nomenclature was soon seen replicated across Europe with Shariah4Belgium, Shariah4Holland, Shariah4Denmark, Shariah4Italy, Shariah4Finland, and even briefly Shariah4Poland. In France a group called Forsane Alizza (Knights of Pride) emerged as the local clone of the group (sometimes using Shariah4France) and in Germany Millatu Ibrahim (the religious community of Ibrahim, a name drawing on the title of a book by Muhammad al Maqdisi) took on the mantle. Millatu Ibrahim is a name that has since appeared in Norway, Holland, and Denmark as well). In Scandinavia, Profetens Ummah (the Umma of the Prophet) represents the ideology in Norway and Kadet til Islam (Call to Islam) is the lead group in Denmark. All of these groups adopted a narrative and approach clearly modeled on ALM, and in many cases this was allegedly the product of direct contact and training by Choudary. For example, in March 2013, he visited Helsinki, Finland where he spoke alongside Awat Hamasalih, a British national of Kurdish origin from Birmingham, at an event organized by Shariah4Finland to celebrate the tenth anniversary of local Iraqi radical leader Mullah Krekar’s incarceration. Choudary reciprocated this generous hosting, inviting Hamasalih to speak when he was back in the UK. This example of travel is representative of Choudary’s contacts with affiliate groups, and there are reports that he and other key ALM members travelled around Europe to support their events. Similarly, there are reports that key individuals from regional affiliates have come to London. And there are multiple reports of Choudary (and Omar Bakri) preaching to supporters in Europe over PalTalk using web cameras and interactive online messaging. Both Choudary and Mizanur Rahman have also communicated extensively with supporters over Twitter. I have regular contact with Hussain and Ibraheem (two group leaders). There are no administrative links between us, but I am a mentor and adviser for them. There are many people who claim they represent Islam, but I see the Prophet’s Umma as one of the few voices in Europe that speak the truth about Islam without compromise. Choudary helped Profetens publish videos and develop a style to preach and call people to their radical brand of Islam. In other contexts people reached out to Choudary having heard about him in the press. Anas el-Abboubi was a young man born in Morocco who moved to Italy when he was young. An up-and-coming rapper, he was featured on MTV Italia as one to watch under his rap nom-de-music MC Khalif. This lifestyle, however, seemed unappealing to him and instead he was drawn to violent Islamist ideas and began an online conversation with Choudary over social media in which he asked for his advice about how he could advance radical ideas in Italy. El-Abboubi also participated in PalTalk sessions led by the group’s creator Omar Bakri and he bought plane tickets to visit the Shariah4Belgium group who he had also connected with online. Soon after this, el-Abboubi established Shariah4Italy, a short-lived organization that seemed to flourish and shrink with its founder. By October 2013 he fled Italy to join the Islamic State along a route that took him through Albania. The degree of influence that Choudary had over his decision-making process is unclear from the public domain, but it is clear that he and ALM had some influence over the young man, something exemplified by his establishing of Shariah4Italy despite a background in Italy that was largely detached from extremist ideologies and groups. some salafist individuals and groups in the EU, such as the Sharia4 movement, seem to have heeded the advice of prominent jihadist ideologues to stop their controversial public appearances in Europe….instead, they have been encouraged to participate in what these ideologues describe as a ‘jihad’ against un-Islamic rule in Muslim countries. There is further evidence of Omar Bakri playing an active role in helping people go fight in Syria. This is evident in the case of Shariah4Belgium, a clone established in 2010 after Fouad Belkacem, a Moroccan-Belgian who had served some time in prison for theft and fraud, came to the UK to learn about how “to start something in Belgium.” Drawn to the bright light of Choudary’s celebrity, Belkacem listened as the established Briton “went through the history of ALM, how we set it up.” The Belgian took the lessons to heart and returned to establish a similarly confrontational organization back home. Choudary and others were occasional visitors and both Choudary and ALM “godfather” Omar Bakri would provide online classes for the group in Belgium. In 2011, one of Shariah4Belgium’s core members left Belgium to seek out their mentor Omar Bakri in Lebanon. Now formally excluded from the United Kingdom by the Home Secretary, Omar Bakri continued to draw journalists and radicals from across the world. Nabil Kasmi was one of these young men, arriving in Lebanon as the conflict in Syria was catching fire. He returned to Belgium a few months later, but then in March 2012 headed off to the Levant again, this time going through Lebanon to Syria. At around the same time, another group associated with Shariah4Belgium were intercepted traveling to Yemen on suspicion of trying to join a terrorist group. Nabil Kasmi’s success, however, highlighted the options offered by the conflict in Syria. In August he returned to Europe, only to leave again on August 20, this time followed days later by a cluster of some five members from the group who all ended up fighting with the Islamic State in Syria. Over time, more and more of the group went to Syria, drawing on their Belgian and other European contacts from the broad ALM family of organizations. The exact numbers are unclear, but it is believed that at least 50 Belgian fighters in Syria and Iraq have roots in Shariah4Belgium. One of the few who failed to travel to Syria or Iraq was Fouad Belkacem, who was instead jailed in February 2015 for 12 years for recruiting and radicalizing people to go fight in Syria and Iraq. On trial with another 47 people (the majority of which failed to appear in court as they were believed to be fighting or dead in the Levant), Belkacem’s trial seemed to be the capstone in the story of ALM’s European links to the battlefield in Syria and Iraq. What is not yet completely clear is the degree to which these networks are ones that are producing terrorist plots back in Europe. There are growing numbers of plots being disrupted in Europe with links to the battlefield in Syria and Iraq, though it remains uncertain whether these are being directed by the Islamic State or other groups from their safe haven in Syria and Iraq. Some plots, like that in Verviers, Belgium and at least one of those in the UK, are reported by authorities to show clear evidence of connections to the battlefield, but the nature of these links remains somewhat opaque. Looking to the ALM-associated networks across Europe, it remains unclear the degree to which they have thus far been credibly associated with attack planning. Reports around the January raid in Verviers, suggested some possible linkages (especially given the timing near Fouad Belkacem’s trial), but they have yet to be confirmed publicly. What has been seen, however, is the emergence of lone actor-style terrorism on the periphery of the group’s networks. A case in point is that of Brusthom Ziamani in the UK. Ziamani was a troubled teenager who sought out Anjem Choudary and his friends as a surrogate family. Having tried to ingratiate himself with the group and even considering travel to Syria, Ziamani instead decided to emulate his heroes Michael Adebolajo and Michael Adebowale and their murder of British soldier Lee Rigby in 2013. Taking a knife, axe, and Islamist flag, Ziamani was planning on butchering a member of the security forces before police intercepted him. He was convicted of attempted murder and plotting to commit a terrorist act, and sentenced to 27 years incarceration. There is no clear evidence that Ziamani told Choudary what he was going to do, but Ziamani’s case has been championed by ALM-associated Twitter accounts in the UK. In contrast, on the battlefield, individuals associated with ALM- related organizations appear in a number of both prominent and less high-profile roles. Reflecting their preference for noisy self-promotion and in-your-face dawa (proselytization), many are active on social media. One particularly prominent figure in this regard was Rahin Aziz, who fled to Syria after being sought in conjunction with an assault on a football fan in the UK. In Syria he quickly aligned himself with the Islamic State, and started to actively post across social media platforms. Among images to emerge were ones of him posing with weapons with Denis Cuspert, a prominent member of the German al-Mujahiroun linked group Millatu Ibrahim. when I came to sham the amount of brothers from other countries who recognized me and agreed n even said were by us….what we did with demos etc aided the jihad, global awareness etc which motivated many to go fight jihad. Belgium many times, delivered lectures and me met from Europe there….many 3-4 times….France twice….Holland where we took part in a conference about khilafah…I knew the brothers from Germany….Their ameer abu usama al Ghareeb contacted me when he came out of prison….he asked me to do some videos for them….met Denmark guys in Belgium even in UK they came to visit us. It was a network fostered in Europe maturing and re-networking on the battlefield in the Levant. Others seem to have taken to the battlefield to undertake activities largely similar to those they were carrying out previously in the United Kingdom. For example, Siddartha Dhar, a Hindu convert also known as Abu Rumaysah, was arrested alongside Anjem Choudary in September 2014. However, unlike his teacher, he took his passport and jumped on a bus to Paris with his pregnant wife and family, the first leg in a journey that ended with him living under the Islamic State a month later. In typical ALM style, Dhar decided to alert authorities to his presence through the posting of a photo of himself holding an AK-47 in one hand and his newborn baby in the other. Since then, Dhar has periodically re-emerged on Twitter and other social media, and in May 2015 became prominent once again when a book was published under his kunya (jihadi name) about life under the Islamic State. These are only a few of the men and women to have gone to join the Islamic State from the ALM networks. Exact numbers are difficult to know, but certainly from the UK alone, more than a dozen prominent individuals from these networks have gone over, while others have attempted to go. What remains worrying is that there continues to be a community of activists associated with these groups who are seeking to go fight in Syria and Iraq, and also that the pool of support in Europe remains fairly constant. One illustration of this is that in the wake of the reports of Rahin Aziz’s death in a U.S. strike, a sweet shop in East London issued candies celebrating his martyrdom and a vigil was held for him that appeared to show a few dozen people praying in his honor. A few days later, three men were arrested in the Luton area. One was released while the other two (an uncle and nephew) were charged with plotting to carry out a terrorist attack in the UK intended to attack and kill military personnel. Some reports suggested the plot was an attempted beheading of a U.S. serviceperson in revenge for Aziz’s death. Details are unclear, though the men were allegedly also attempting to go to the Islamic State, and the case is working its way through the courts and is likely to come to trial in 2016. The arrest and charging of Anjem Choudary and his principal acolyte Mizanur Rahman is a significant moment in ALM’s history. The group has developed from its early days when London was a center of jihadist thinking with ALM at its core, drawing in radicals from across Europe and around the world. Since the prominence ALM achieved in the late 2000s, it has now become a net exporter organization around Europe, still drawing people to London, but then also watching as they return home to establish affiliate networks and communities. This European generation of ALM supporters is increasingly proving to be at the heart of Europe’s radical Islamist community connected with Islamic State and the conflict in Syria and Iraq. Given the volumes of plots that have emerged from these networks in the past in the United Kingdom in particular, it seems likely that similar problems are likely to emerge from the European ALM networks. Raffaello Pantucci is Director of International Security Studies at the Royal United Services Institute (RUSI) and the author of We Love Death As You Love Life: Britain’s Suburban Terrorists (UK: Hurst/US: Oxford University Press). You can follow him at @raffpantucci. In March 2014, Choudary and other ALM activists had been identified in a set of protests in London clearly inspired by the Islamic State. Dipesh Gadher, “Preacher Anjem Choudary investigated over ‘road show’ linked to jihadists,” Sunday Times, March 9, 2014 . Statement by Metropolitan Police, August 5, 2015 . Dominic Kennedy, “Radical al-Muhajiroun group is behind most UK terror plots,” Times, March 21, 2015. Morten Storm, Paul Cruickshank and Tim Lister, Agent Storm: A Spy Inside al-Qaeda, (London: Penguin, March 2015), p. 334. Olivier Tocser, “Les Secrets d’un Emir,” Le Nouvel Observateur, March 20, 2014. The documentary is available online, and was recounted in a chapter in Jon Ronson, Them (London: Picador, 2001). Ronson was also the director of the documentary. “Cleric Bakri ‘will return’ to UK,” BBC News, August 9, 2005. Mullah Krekar, the founder of the Ansar al Islam movement that was involved in fighting in Iraq, is an infamous radical preacher with whom Choudary has developed a link. Laura Helminen, “Radical Muslim Preacher Spoke in Helsinki,” Helsingin Sanomat, March 13, March 28, 2013.
. In January 2015, authorities in Finland sought to eject Hamasalih. According to coverage around this time, Hamasalih, in contrast to most Kurds, was not seeking nationhood with his activity, but instead “his goal [was] jihad, an Islamic caliphate, and sharia, the law of Islam” as the local newspaper said. Anu Nousiainen: “Finland Expelled Radical Extremist From Turku to UK – ‘Serious Threat to Public Security,’” Helsingin Sanomat, January 15, 2015. See Ben Taub, “Journey to Jihad,” New Yorker, June 1, 2015. Shortly prior to their arrest, Rahman and Choudary (alongside others), made a PalTalk video in which they answered questions from an American audience. Similar videos have been made for European audiences. There has been no comprehensive mapping of ALM’s online links and contacts, but almost all of the prominent members (in Syria and Iraq or back in Europe) have accounts and numerous others who aspire to be involved in these groups’ proselytization create accounts that are very similar. The best sense of outreach and effectiveness of this online contact is suggested in the fact that Choudary has 32.9K followers on Twitter, while Rahman has 29K. Of course, number of followers does not equate to contact and influence, but both are very active online and respond to people’s questions and contacts. Andreas Bakke Foss, “British Extremist Calls Himself a Mentor for Norwegian Islamists,” Aftenposten, March 3, 2013. Lorenzo Vidino, Home-Grown Jihadism in Italy: Birth, Development and Radicalization Dynamics, (Milan: Istituto per gli Studi di Politica Internazionale, 2015), pp. 63-67. European Union Terrorism Situation and Trend Report 2014, (The Hague: Europol, 2014), p. 21. Paul Cruickshank, “A View from the CT Foxhole: Interview with Alain Grignard,” CTC Sentinel, 8:8 (August, 2015). J. La. Avec Belga, “Sharia4Belgium qualifie de groupe terroriste, 12 ans de prison pour Fouad Belkacem,” La Libre, February 11, 2015. Paul Cruickshank, Steve Almasy, and Deborah Feyerick, “Source: Belgium terror cell has links to ISIS, some members still at large,” CNN, January 17, 2015. “Aantal radicalen in Wallonie wordt onderschat,” Het Laatste Nieuws, January 16, 2015. Tom Whitehead, “Brusthom Ziamani: the former Jehovah’s Witness who was radicalised within weeks,” Telegraph, February 19, 2015; Prosecution Opening Note, Regina vs. Brusthom Ziamani, Central Criminal Court, February 9. 2015. Regina vs Brusthom Ziamani, Sentencing Remarks of HHJ Pontius, Central Criminal Court, March 20, 2015. Also known as Deso Dogg or Abu Talha al-Almani, Cuspert was a prominent German former rap star turned jihadi and activist for German ALM equivalent Millatu Ibrahim. He was one of several Miltatu Ibrahim figures to travel Syria. The Austrian founder of the group Mohammed Mahmoud was one of Cuspert’s close contacts. Mahhmoud left home aged 17 in 2002 to train in an Ansar al-Islam camp in Iraq. After his return to Europe he played a major role in the Global Islamic Media Front (GIMF), a source for non-Arabic language translations of jihadi material. In 2007 he was arrested by authorities, leading to a four year jail sentence. On his release he moved to Berlin and founded Millatu Ibrahim, which rapidly became the center of Germany’s Salafi scene. In 2012 he fled to Egypt before becoming a senior figure in the insurgency in Syria. He is now considered one of the most senior figures in the German and European foreign fighter contingent, helping produce the Islamic State propaganda magazine Dabiq and al-Hayat media center releases. He is believed to continue to draw on his ALM-linked European contacts to recruit. See “In Search of ‘True’ Islam: Salafists Abandon Germany for Egypt,” Der Spiegel, August 13, 2002; Souad Mekhennet, “Austrian Returns, Unrepentant, to Online Jihad,” New York Times, November 15, 2011; Petra Ramsauer, “Mohamed Mahmoud: A Holy Warrior’s Book,” Profil, August 17, 2015. Author archive: Twitter conversation between Secunder Kermani and Rahin Aziz. “New Brit propaganda guide by Brit sells ‘Costa’ caliphate,” Channel 4, May 19, 2015. “Three in terror-related arrests in Luton and Letchworth,” BBC News, July 14, 2015. “Man charged with US military terrorist plot,” Sky News, July 21, 2015. Mike Sullivan, “Foiled: British terror attacks in days,” Sun, July 14, 2015. The Texas Attack: An Expression of Daesh’s Reach? A new brief reaction piece for my home institute RUSI looking at some of the current trends in ISIS and jihadism. My preference is to use ISIS, but it appears as though the institutional choice is Daesh. Undoubtedly more on this topic to come. In the meantime, I have been doing book promotion events around town, thanks to those who have hosted me and am looking forward to future ones. For those interested, here is me talking to the Henry Jackson Society. I am going to be at the Bradford Literature Festival this weekend, the Hay Festival on the 31st May, and the Lewes Festival on July 18th. And hopefully more of those to come! Please also feel free to leave comments on Amazon about the book should you read it! The jihadist movement known as Daesh has claimed responsibility for the aborted attack on an art contest in Texas. But other than shared motives, there are hardly anyreal linkages. Overreaction and misreading of the threat will merely play into their hands. The claim by Daesh (or ISIS, as it is also known as) of some connection and responsibility for the attempted attack on Sunday 3 May 2015 in Texas is credible. While it is unlikely that the senior leadership within the group tasked the American pair or saw the event in Texas as a globally significant target, it is perfectly possible that it will emerge that the two men had at least some online connection to the group and were spurred into action by a combination of this contact and the group’s regular exhortations to its followers to launch attacks in the West. At the same time, it is not clear that this is in any way an expression of the beginning of a campaign by the group to launch terrorist attacks outside its territory or that we need to worry about Daesh anymore now than before. Rather, Daesh continues to show itself to be an opportunistically canny organisation that is able to read global trends and stoke public debates at the right moment to maximise their apparent reach and power. The threat picture for the immediate future is likely to be a continuing pattern of similar attacks, alongside a continuing potential menace of more classically directed terrorist cells. This seemingly enhanced threat, however, has to be kept in perspective and care needs to be paid not to overreact. A measured response will help deal with the problem in the longer term, while an exaggerated response will only fuel it. Daesh remains a primarily Middle Eastern focused organisation, intent on growing and consolidating its territorial gains in Iraq and Syria. At the same time, over the past few months there has been an increasing level of connectivity and interaction between its core in Mosul/Raqqa and its regional Wilayats (provincial governorates) in Libya, Egypt, Afghanistan and Yemen. The degree of strength of these regional connections is not always clear, though looking at the Libyan case in particular, it is clear that there is some strong link between the centre and what is happening in that country in terms of ideology, means and direction. A series of attacks on foreign targets in Tripoli, grim beheading videos being done to a schedule dictated from Syria/Iraq and stories of fighters and money flowing from the Levant to Libya point to something more than just an ideological affiliation. In Egypt, Afghanistan and Yemen at least there is some evidence of ideological and possibly individual, but less clear is the degree to which this is a strong flow with much direction, rather than exploratory links. On the purely aspirational end of the scale, there is the link to Boko Haram – an organisation that has shown itself to be even more opportunistic than Daesh and has proclaimed links to Al-Qa’ida and others repeatedly over the years with little tangible evidence of much by way of strong connections. In parallel to this there has been the growth in inspired and instigated attacks in the lone actor model: plots undertaken by individuals or small cells lacking any clear command and control from an outside organisation. Choosing soft targets that can broadly be captured under the aegis of the global struggle between Islam and the West, these individuals get caught up in the fervour and hysteria around Daesh and launch attacks at home in the West under their own direction. Some cases appear to demonstrate links back to Syria (like Mehdi Nemmouche in Brussels) some may be reacting to travel restrictions (like Michael Zehaf-Bibeau in Ottawa), while others appear simply to be attracted by the allure and hysteria of the group (like the spate of incidents in France late last year or Man Haroun Monis in Australia). For some of these individuals, Daesh’s narrative is simply the loudest in the public conversation for them to draw on. Lone actor or copy-cat, whichever model it is, Daesh can subsequently claim it or praise the incident and appear as though it is somehow responsible for a global wave of terror. In reality, both trends are extensions of what has been going on with jihadist terrorism for the past few years. Since around 2010 al Qaeda core’s capability and links globally have shrunk as the group’s ideology has increasingly found that the local causes that it would parasitically attach itself to increasingly moved towards advancing their own more local agendas rather than the group’s global directives. When launching attacks, regional affiliates would still use the jihadist rhetoric and targeting choices, but it was increasingly hard to see strong levels of command and control from the core. There were of course exceptions to this like Yemen where AQAP retains a strong core following loyal to the movement’s globalist perspective. But for the most part regional affiliate groups increasingly drifted away from the core’s orbit as Al-Qa’ida’s remnant leadership spent its time hiding from drones in Pakistan’s hinterlands. The result has been a fracturing of the global jihadist movement operating under Al-Qa’ida’s ideological banner. As leaders have been killed, it has led to groups splintering into different factions. Furthermore, with a weakened core, regional affiliates have shifted in their targeting and intent back towards their own regions. In launching attacks they will still choose international targets as these bring attention and appear to be part of a global cause. Often, however, the degree to which they have been directed from the core is limited. Examples include the In Amenas attack in Algeria by an off-shoot of AQIM, or the al Shabaab linked attack on the Westgate Mall in Nairobi. Into this fractured scene steps Daesh, offering a more hardline ideology, a new leader claiming to be Amir al Mu’mineen (commander of the faithful) who commands a territory he declares a Caliphate. Here is a narrative of success that stands in contrast to Al-Qa’ida’s declining fortunes. This quickly offers an appealing alternate power base that becomes the opposite pole to the current established jihadist narrative directed by Al-Qa’ida and draws in many of the disaffected and detached affiliate groups. Daesh appeal to them is not necessarily the ideology of the group, but rather the fact the group offers an alternate expression and successful banner to the status quo for them to attach themselves to. The lone actor phenomenon is also not one that Daesh can claim stake to owning. Lone actor plots started to emerge in 2007/2008 (arguably Bilal Abdulla and Kafeel Ahmed’s attempted double bombing in London and Glasgow in 2007 was an early expression demonstrating no level of direction by a group, though some connectivity to terrorist networks in Iraq), and have been an increasingly regular feature of the terrorist threat picture since then. In 2010 Al-Qa’ida in the Arabian Peninsula (AQAP) sought to try to harness the growing wave of such attacks and spur them further on through Inspire magazine and its ideology of ‘just do it’ attacks and ‘open source jihad’ that made jihadi terrorism accessible and actionable by everybody. But there was little tangible evidence the magazine did much more than stoke fires that were already burning. The magazine became a staple feature of terrorism investigations. A growing number of plotters tried to build bombs to the magazines design and in online forums extremists increasingly talked proudly of being ‘lone wolves.’ But the trend towards this type of terrorism was underway prior to the magazine and there has been little clear evidence that the magazine can be singularly blamed for any specific plot. Daesh has merely taken this strategy to the next level through its active promotion of the idea of such attacks through speeches, magazines and increasingly through individual fighters who connect through social media to the aspirant keyboard warriors who have not chosen to make the trip to the Levant, but seek it out instead online. By creating more noise around the idea of such attacks, they become more attractive and the group creates a self-fulfilling prophecy in its narrative. This results in more people hearing it and more disaffected folk concluding that if they want to make themselves heard (for whatever reason) then Daesh’s ideology is the one to attach themselves to. All of this needs to be borne in mind against the backdrop that the ideology of violent Islamist inspired terrorism as one of the dominant global anti-establishment ideologies of the moment. Previously disaffected folk might be drawn to other movements, Al-Qa’ida or Daesh are now the alternative global movement. Again, rather than creating something new, Daesh (and Al-Qa’ida before it), have simply harnessed and attempted to spur on a trend that was already underway. The importance of understanding the proper roots of these trends is to mitigate against the dangers of overreaction to them. If the Western reaction to the attack in Texas (and other future possible attacks) is to attack the organisation in a large fashion involving deployed armies and forces, this will have exactly the effect the group is likely hoping for. An overreaction draws it into more direct conflict with the West making it both seem more powerful than it is, showing it able to stand up and fight directly with the world’s superpowers. It feeds into the group’s narrative of where it stands in the world and helps it become more important than it really is. Instead, the focus needs to be on fixing the underlying reasons behind the contexts where the group’s ideology is able to take root. In Syria this means finding ways of bringing the brutal civil war to a close. In Iraq it involves building a participatory government so that the country’s Sunni’s do not look to groups like Daesh as defenders. In Libya, Yemen, Afghanistan and Egypt it involves solving local problems that will help reduce the space in which the group is able to permeate. And in the West, it involves engaging with people who are so disaffected from societies that they feel they want to rebel violently against them. None of this is easy, and for Western government’s to succeed the reality is they need to target limited resources on specific countries abroad in a global division of labour, and at home need to find ways of developing grass roots programmes to engage with specific individuals who are drifting towards extremist ideologies. But key to making sure that we do not prolong this problem any longer than it needs to be is a clear understanding of the nature of the threat that is faced. A new piece with former colleague Laura looking at the phenomenon of criminals showing up on the battlefield in Syria. More on the topic of foreign fighters from Europe in the near future – including something longer that will eventually land! Thanks to the Airey Neave Trust for their generous support of this work. Individuals with known criminal histories are a surprisingly common feature of the current Syrian battlefield. While their motives may be a combination of redemption and opportunism, returnees in this mode pose a complicated threat picture for security services to process if they return. Since the conflict began in 2011, Syria has become a magnet for European foreign fighters. Determining exact numbers is an imprecise science, but the most recent alarming figure to emerge in the UK is the anonymous government claim that some 250 British fighters are now back on UK shores having experienced the battlefield. Although there is no single profile of those who decide to leave their homes to join the fighting in Syria, an interesting feature is the seemingly high proportion of individuals with criminal pasts who are appearing on the battlefield. This is an aspect of particular concern to security services since it gives them access to criminal networks for whom weapons are easier to obtain, helping them climb over a crucial hurdle when putting together a terrorist plot. There are three broad criminal profiles seen among those travelling to Syria: those with a history of petty crime; those who have been incarcerated for extremist Islamist behaviour; and career criminals. Petty criminals are amongst the most common feature of the battlefield in Syria. 23-year-old Ali Almanasfi was born into a Syrian family in West London and had a troubled childhood involving gangs, theft, drug and alcohol abuse. His father – a bus driver originally from Syria – had sent Almanasfi back to Syria in an attempt to change his behaviour. In 2009, however, Almanasfi was arrested and sentenced to prison after he attacked an older man while drunk. He was initially sent to Feltham Young Offenders institution, a prison that has had the leader of the 21/7 London bomb plot cell, Muktar Said Ibrahim and Shoe Bomber Richard Reid pass through its gates. It is believed that it was in prison that he grew religious, and in January 2013, he left for Syria. Falsely believed to have died in May after Syrian security services showed images of a mangled body and his (previously lost) passport, Almanasfi was last heard from in June when he confirmed he had fought with the Ahrar Shaam brigade of fighters under the Islamic Front umbrella organisation. Others draw on their criminal pasts to fund their travel to Syria. Last September, five Frenchmen – including one who claimed to have recently returned from Syria – stole €2500 from a fast-food restaurant in Paris to fund their travel to Syria. Choukri Ellekhlifi, a 22-year-old Londoner was alleged to have funded his travels to Syria by mugging people in London’s affluent Belgravia with a taser-style gun. His fellow mugger, 21-year-old Mohamed ElyasseTaleouine, is currently serving a ten-year sentence in part for possession of a converted 9mm machine gun and 24 rounds of live ammunition. Ellekhlifi was sentenced in absentia to 6 years in prison but escaped to Syria when on bail. He went on to fight with Jabhat al-Nusra and was eventually killed in an August 2013 battle against pro-Assad forces. In addition to petty criminals, Europeans with Islamist-related arrests have also appeared in Syria. The 23-year-old Mohammed el-Araj (who trained in Syria alongside Choukri Ellekhlifi) from Notting Hill was the second Briton confirmed dead in Syria in mid-August last year. A mechanical engineering student, el-Araj served 18 months of a two-year sentence in prison for violently protesting outside the Israeli embassy in London in 2009. Others arrested alongside him at the protest later died in Somalia alongside al Shabaab. In some ways most alarming, however, is the presence of hardened criminals on the battlefield. Danish Abderrozak Benarabe was the leader of the recently disbanded, notorious Blågårdsgade gang, commonly known as ‘Big A’. In 2006 he was acquitted of hiring two hit men to kill five others and instead charged with aggravated assault and blackmail, serving four and a half years in prison. After his release, he traveled to Syria accompanied by a journalist to apply his skills in a war setting before returning again to Denmark. He is currently in custody on more recent charges of assault and robbery. Some of these fighters will die in battle in Syria,or stay out in the region. Hundreds, however, are returning home where in some cases they are returning to criminal activity. Two Dutch returnees from Syria who are understood to have been involved in youth criminal gangs prior to their travel were part of a five-person cell arrested last month for planning an armed robbery in the Netherlands. Genc Selimi, a 19-year-old Kosovar, was one of the six arrested for plotting a terrorist attack on a major European city after he returned from a stint in Syria. Prior to leaving for the conflict, he had been arrested in 2012 for gun possession. A number of other, less public, cases have emerged in the UK of fighters in Syria with already strong connections to hardened criminals who have already flirted with radical ideas and had access to weaponry, though so far it is unclear whether these have translated into plots. In some cases, there is evidence thatthese connections providing useful logistical support for those trying to leave. The one plot that has publicly emerged in any detail in the UK is the cell that had allegedly come back with plans to launch a Mumbai-style attack, though it is unclear that they had secured any weapons. The terror-crime nexus is not a new one. People with criminal pasts are often drawn to extremist ideologies as a way of atoning for past sins, though often they donot leave their pasts completely behind. But the high instance of people going to Syria with criminal pasts of every sort adds a further worrying dimension to the phenomenon of foreign fighters going to Syria. And on the topic of Syria and foreign fighters from Europe, here is a piece that I wrote a little while ago that has now gone live for a new outlet, Alternatives Internationales Hors-séries a French outlet. For those who cannot read the below French, it is similar to this piece I did for RUSI. More on this subject en route. Des centaines de jeunes Européens sont partis faire le jihad en Syrie. Et la plupart en reviendront. Radicalisés, vengeurs, ou indifférents, ils sont devenus la bête noire des services de renseignement. Le conflit syrien est devenu le terreau le plus fertile du jihadisme mondialisé. Alors que l’on va entrer dans la quatrième année du conflit, la guerre civile syrienne est devenue un pot-pourri d’extrémistes, jeunes sunnites ou chiites venant combattre aux côtés des différentes factions en présence. Parmi eux, on trouve de plus en plus de jeunes Européens. Ces jihadistes occidentaux renforcent-ils la menace terroriste dans les pays européens ? Pour le moment, la guerre en Syrie a surtout alimenté la menace terroriste au niveau régional : une cellule planifiant des attentats en Jordanie a été démantelée, des attaques ont été commises en Turquie ou au Liban. De même, faut-il le rappeler, il n’y a pas de branche européenne d’Al-Qaïda. Parce que l’organisation terroriste peine à faire des émules sur le Vieux Continent, mais aussi parce qu’aucun groupe ne remplit les critères d’adhésion – autonomie logistique et financière, liens établis avec la haute hiérarchie du mouvement – édictés par la maison mère. En outre, si une branche européenne venait à officiellement se faire connaître, la réponse des services de renseignement et de sécurité ne se ferait pas attendre, et elle serait aussitôt arrêtée. Mais les responsables européens ont raison de s’inquiéter, car historiquement nombre de terroristes ont d’abord été des combattants jihadistes. Et à moyen terme, les Occidentaux vont devoir se pencher sur leurs jeunes ressortissants revenant du front syrien, avec l’expérience, l’entraînement et les réseaux qui peuvent être utilisés à des fins terroristes sur leurs sols. Les plus inquiétants sont ceux qui sont directement missionnés par des organisations jihadistes, comme le montre l’exemple de Mohammed Siddique Khan et Shezad Tanweer, le duo au coeur des attentats de Londres de juillet 2005. Khan, la tête pensante, avait réalisé nombre de voyages au Pakistan et en Afghanistan où il s’était entraîné dans un premier temps avec les groupes jihadistes du Cachemire, puis plus tard avec les Afghans. Son troisième voyage en Afghanistan aurait dû être le dernier – il avait prévu d’y mourir comme il l’a indiqué dans une vidéo adressée à sa jeune fille – jusqu’à ce qu’il rencontre des membres d’Al-Qaïda le convainquant de l’intérêt de mener une attaque sur son sol d’origine. D’autres ont emprunté ce chemin, mais sans parvenir à leurs fins, comme Faisal Shahzad et Najibullah Zazi, qui voulaient chacun commettre un attentat à New York après des voyages en Afghanistan et au Pakistan. Avant de partir combattre déjà, ces hommes nourrissaient une haine de l’Occident, et voyaient dans le fait de détenir un passeport occidental l’occasion de commettre plus facilement un attentat. Un tel sentiment anime-t-il ceux qui sont aujourd’hui en Syrie ? Leur rhétorique et leur allégeance à Al-Qaïda pourraient laisser penser qu’ils partagent ses convictions, mais, pour l’heure, leur priorité est bel et bien de faire tomber le régime d’Assad, pas d’attaquer l’Occident. La deuxième façon dont la menace s’est exprimée dans le passé, c’est à travers des individus qui se sont rendus sur les champs de bataille jihadiste, qui s’y sont constitué un réseau, s’y sont entraînés, puis sont rentrés pour planifier une attaque de leur propre chef. Par exemple, Bilal Abudllha, un médecin irako-britannique qui avec le soutien de son ami Kafeel Ahmed, a tenté de faire exploser deux voitures piégées en plein Londres, et réussi à lancer une voiture remplie d’explosif dans l’aéroport international de Glasgow, en 2007. Abdullah s’était auparavant rendu en Irak, s’était entraîné parmi les insurgés, mais il n’est pas sûr que ces derniers lui aient demandé de commettre des attentats au Royaume-Uni. Dans la même veine, Mohamed Muhidin Gelle, un jeune dano-somalien proche des Chebab avec qui il s’était entraîné, a été accusé de fomenter avec d’autres un attentat contre Hillary Clinton. Le complot a été découvert, et Gelle a été extradé vers le Danemark. Là-bas, il semble qu’il ait pu reprendre une vie normale, jusqu’au 31 décembre 2009 où il s’est attaqué au domicile du caricaturiste Kurt Westegaard, armé d’une hache et de sabres. Mais, même si les Chebab ont admis connaître cet individu, rien ne prouve qu’ils ont été les commanditaires de cette tentative d’assassinat. C’est plutôt ce profil que l’on retrouve en Syrie. Parmi la foultitude de jeunes hommes prêts à faire le jihad à l’étranger, il est quasiment certain qu’au moins l’un d’entre eux rentrera à la maison vivant, entraîné, et décidé à agir en son nom propre. Est-ce cela qui explique le faible soutien des pays occidentaux à la rébellion syrienne ? En tout cas, c’est ce genre d’individus qui devrait inquiéter leurs diplomates et gouvernants. Enfin, il y a ceux qui partent se battre, rentrent pleins de colère, mais pas suffisamment pour commettre un attentat. Ils préfèrent aider les autres jihadistes à trouver des fonds et deviennent des figures du radicalisme, à l’instar du prédicateur anglo-égyptien Abu Hamza al Masri, célèbre pour ses prêches enflammés dans la mosquée de Finsbury Park à Londres. Jeune homme fuyant la conscription en Égypte, Abu Hamza (alias Mustafa Kamel) était parti combattre les Soviétiques en Afghanistan. Là-bas, il a rencontré Abullah Azam, figure tutélaire du jihad antisoviétique, avant de rentrer blessé et mutilé, ce qui a d’ailleurs contribué à sa renommée. De retour au Royaume-Uni, il est devenu prédicateur, puis petit à petit il est apparu comme une figure incontournable de la mouvance extrémiste britannique. Même s’il ne s’est jamais personnellement impliqué dans une attaque terroriste, il a radicalisé et influencé toute une génération de jeunes hommes, les persuadant de partir se battre à l’étranger, de s’entraîner, voire de perpétrer des attaques en Occident. Il y a, à des niveaux d’influence moindre, bien d’autres exemples comme Abu Hamza, et la plupart d’entre eux n’ont jamais attiré l’attention. Ces individus sortent souvent des radars publics, soit parce qu’ils rejoignent un groupe encore inconnu des services, soit parce qu’ils sont très prudents, soit parce que tout simplement ils n’ont pas l’intention de commettre un attentat. À cause d’eux, non seulement plus de jeunes sont tentés d’aller combattre en Syrie, mais surtout l’idéologie du jihad se répand en Europe, car leur expérience personnelle est aisément transposable dans le récit plus global du jihad. Ainsi, le problème du terrorisme islamique qui semblait en déclin va en fait s’étendre et se prolonger en Europe. Même s’il est impossible de savoir combien exactement de jeunes Occidentaux sont partis (ou prévoient de) combattre en Syrie (quelques centaines d’Européens, estiment les services de renseignements, mais ils sont certainement plus nombreux), l’expérience montre que lorsque des Occidentaux rejoignent les champs de bataille jihadiste, la menace terroriste se renforce de manière générale. Reste pour les services de renseignements à déterminer quand et comment celle-ci pourrait se matérialiser. La Syrie hantera l’Europe pendant de longues années encore.